Now that the new year has passed, we’re left to decide for ourselves early in the year what kind of person we want to be and how we want to improve our lives. As any homeowner knows, preparing for the coming year also means reassessing the current look of the home. 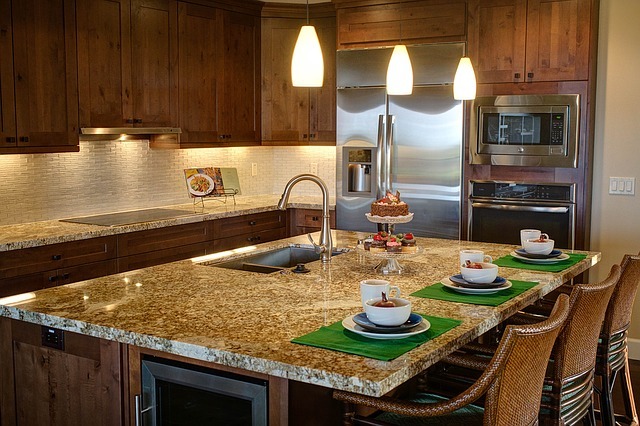 The kitchen space is one of, if not the most, complex areas to design in a home. It’s time to get busy and overhaul your kitchen, so you can make the most of it and enjoy it more this year. If you’re looking to improve your kitchen’s design this year, then you should be open to letting go of your old model and embracing the possibility of looking at different perspectives to improve your home’s look. We’ve got a few items to cover in this list that can be a great addition to your next kitchen makeover. Taking a second look at the items in the kitchen should be at the top of your list. Finding the right areas for improvement will require an assessment of what doesn’t work or what’s worn out. Just like furniture, flooring and worktops need to be replaced if they’ve reached the end of their prime. If they haven’t been maintained properly, then you might want to think about overhauling these and replacing them this year with much more durable material. Consider using pre-coated slabs, such as granite, since these worktops have better sustainability and require less maintenance in the long run. Finding granite worktops in the UK might not be as difficult as you may think, as many top manufacturers have branched out and now offer worktops online through their websites for their customers to consider their options. You should make the most out of the kitchen area that you have. You don’t want to be going from one end of it to fetch an ingredient to go to the opposite end to use it for cooking. A kitchen works best when you have a well-thought-out and practical walk space. Try to make good use of your walls so that it can be used for hanging kitchen utensils within reach to your stoves, extending wall shelves, and even creative installations such as paintings and photographs. Accents can come in different shapes and mediums. A standard option for putting accents in any room is by placing items with contrasting colours to the dominant colour palette. A simple solution to fix a kitchen’s bland palette is by introducing silverware, plates, and cups and saucers with sharp contrasting colours. Tones such as bright blue and green to contrast against the rustic look of light yellow and brown of a traditional wooden-themed kitchen can make a compelling colour contrast. Another popular choice for minimalist house design is making use of lighting to introduce contrast in a room. LED backlights for shelves and cabinets can be an excellent way to improve your kitchen’s look without investing too much. Since LED lights can be programmed, they can emit different shades of colour to match your room’s aesthetic.